In the months following one of the most destructive hurricanes of the past decade, UNC researchers had to act fast. Using a unique grant from the NSF, they’re testing water quality in Lumberton — one of the hardest-hit places during the storm. On October 8, 2016, Diego Riveros-Iregui couldn’t believe what he was seeing. News stations from all over North Carolina — and the nation — streamed endless aerial footage of submerged homes, collapsed roads, and residents escaping their hometowns in kayaks and motorboats. Flooding from Hurricane Matthew caused $1.5 billion in damage to 100,000 North Carolina houses, businesses, and government buildings. The Category 5 storm took the lives of 28 North Carolinians, forced more than 4,000 people to evacuate, and impacted 50 counties across the state, according to the North Carolina Department of Public Safety. “Hurricane Matthew delivered 350 millimeters in rain over 24 hours — that’s about the same amount of rainfall that Chapel Hill receives in three months,” Riveros-Iregui, a UNC geographer, says. As the storm continued to wreak havoc on the state, Riveros-Iregui called his longtime colleague Ryan Emanuel, an environmental scientist at NC State, to learn how his family in Lumberton was faring. Their phone conversation quickly transformed into an idea for a research project as the two discussed the potential effects of Lumberton’s multiple bodies of surface water, stream water, and groundwater connecting due to the flooding. “These coastal environments are relatively flat, so water ponds quicker there than in areas with more slope,” Riveros-Iregui explains. Lumberton is also home to multiple concentrated animal feeding operations (CAFOs) with waste lagoons that overflowed during the flood. Robeson County, alone, is home to more than 285,000 hogs and pigs and about 7.25 million chickens and turkeys in more than 450 barns. Sample collection to test water quality, they decided, needed to begin immediately, before water levels subsided. They applied for a National Science Foundation (NSF) Grant for Rapid Response Research (RAPID), given to researchers with proposals that have “severe urgency.” Within two weeks of their submission, they received about $60,000 to conduct their study, set to begin in December 2016. Although NSF RAPID grants are awarded quickly, they usually don’t accommodate large expenses such as hiring staff. Like emergency responders during a hurricane, Riveros-Iregui and Emanuel had to be resourceful. They solicited volunteers from the UNC Gillings School of Global Public Health and the Curriculum for the Environment and Ecology to help. Today, their team’s collective expertise spans a variety of disciplines, from watershed hydrology and ecology to environmental microbiology to geospatial analysis and anthropology. “I think a unique aspect of RAPID is that it’s very interdisciplinary,” Riveros-Iregui says. The Lumberton swamp overflows with the raw smell of animal excrement. Scraps of paper towels, Styrofoam meat packaging, and other refuse fill the surrounding woods. “Looks like someone dumped their trash here,” says Theo Jass, an environmental scientist at NC State, who’s currently knee-deep in its depths. He sways back and forth as he scoops large samples of water using a graduated dipper (a long pole with a beaker attached to it). On shore, UNC junior Haley Moser bubbles with excitement — regardless of the smell. Today is her first field site visit. She stands at the ready with her water collection containers. 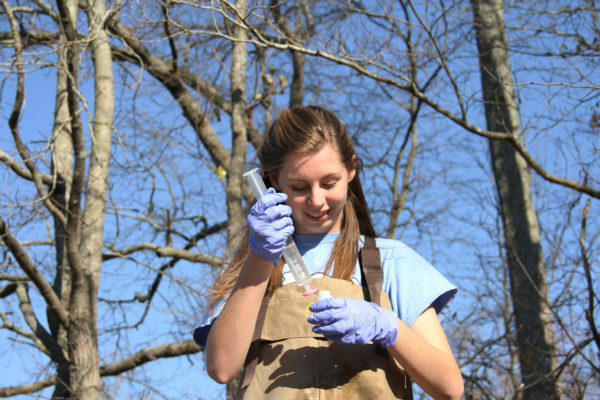 Clad from shoulder-to-toe in tan waders, Moser uses a portable multiparameter to test the pH, oxygen levels, conductivity, and temperature of the water they’re collecting. She writes down her findings on a clipboard. Once she and Jass have filled an array of colored and clear plastic and glass bottles, they pack up all their materials into a large bin and move on to the next site. They’ll repeat this procedure six more times over the course of the day. Lumberton and surrounding Robeson County are home to more than 60,000 members of the Lumbee Tribe — descendants of the Cheraw Tribe and other indigenous peoples who have lived in and around the county since at least the early 18th century. 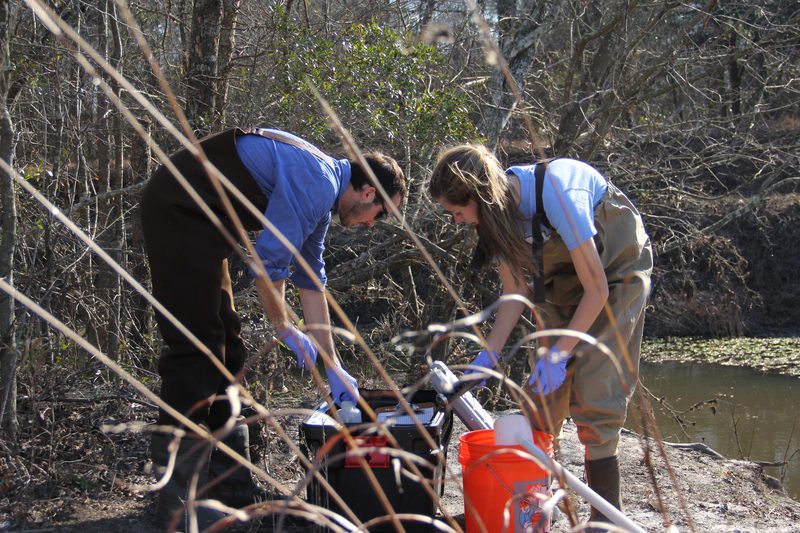 After the storm, Emanuel, a member of the tribe, and Riveros-Iregui decided to also study how the changes in water quality due to the hurricane affected the Lumbee population as a whole. “We want to see if surface contaminants made it to the deep groundwater,” Riveros-Iregui shares. “Once in the groundwater, their residence times could be a lot longer.” Like groundwater, contaminants may disperse slowly — so slowly that they can remain within the watershed for several years. At the end of the study, the team plans to launch a second proposal with the NSF that looks at new questions and hypothesis drawn from the results of testing. Riveros-Iregui also hopes to include information from this project in a new class he’ll begin teaching in Spring 2018. “Geography for Future Leaders” is an interdisciplinary course that he will lead alongside Elizabeth Havice, a UNC geography professor specializing in environmental policy. Diego Riveros-Iregui is an assistant professor of geography within the UNC College of Arts & Sciences. Ryan Emanuel is an associate professor in NC State’s Department of Forestry and Environmental Resources. Haley Moser is a junior within the College of Arts & Sciences, majoring in environmental science, with a minor in geography. Theo Jass graduated from UNC in August 2015 with an M.S. in Geological and Earth Sciences. He currently works as an environmental scientist within the College of Natural Resources at NC State. Co-investigators for this project include UNC chemist Jill Stewart; NC State professors Elizabeth Nichols (UNC PhD), Katie Martin, and Josh Gray (UNC PhD); and Rosalind Franklin University professor David Shane Lowry (UNC PhD and Lumbee Tribe member). This entry was posted in Earth, Video. Bookmark the permalink. Why Do Some Laptops Catch on Fire?